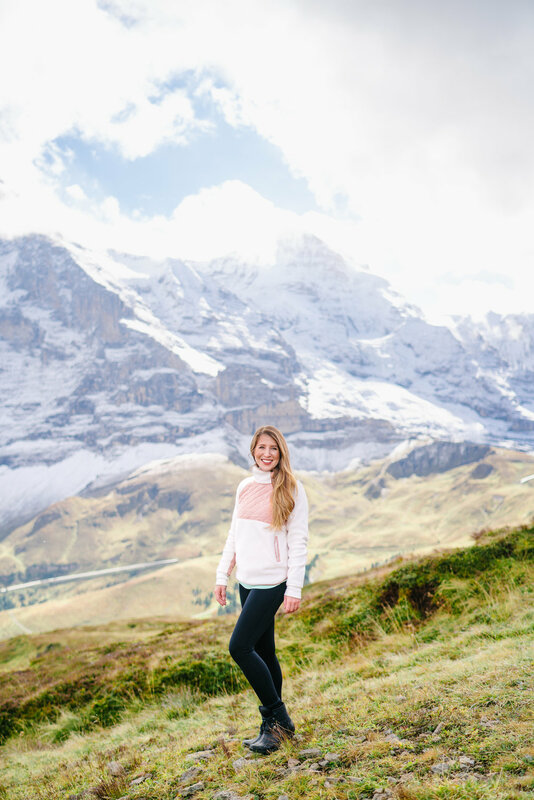 We had the best time in Switzerland with our friends from college and I think we've officially found our new mountain weekend spot! 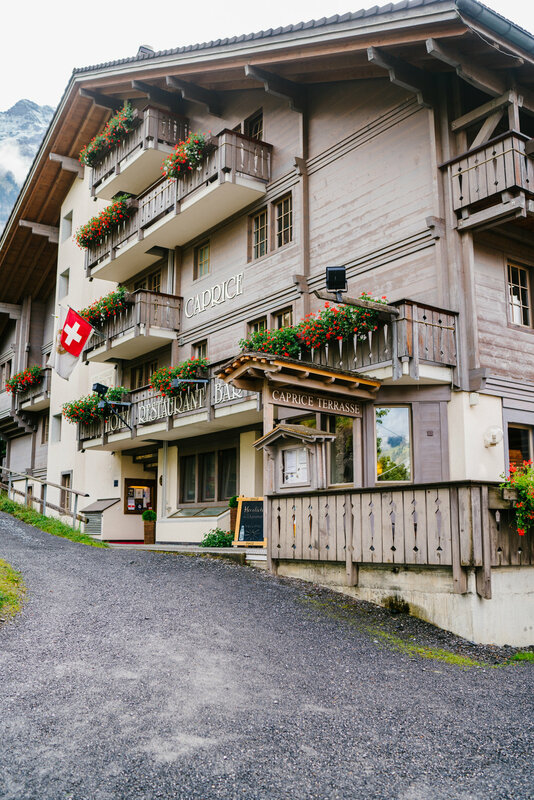 After talking with our friends, we realized we had all purchased flight deals to Europe around the same time in September so we planned to meet up in Wengen (VEHN-gehn), Switzerland, a small town near Interlaken (about twenty minutes by train). We stayed at two different hotels which I loved from a travel planner perspective because I was able to scope out two places for the blog! I honestly don't think you can go wrong with either choice. Dan and I stayed at Hotel Caprice which has epic views of the mountains and a divine onsite restaurant, where we met up with our friends for dinner on the first night. We had drinks on our balcony later that night and I guess we were a little loud because the neighbors complained. Oops, sorry neighbors! Candace and A.D. stayed across the street from us at Hotel Falken, which is this amazing historical hotel that A.D. had visited on his last trip here. We had drinks at their place on the last night and I was falling in love with all of the beautiful details, including gorgeous antiques and photos of the property from the early nineteen hundreds. Also, like everywhere in Wengen, the views are gorgeous. Wengen is such an adorable mountain town. There are no cars allowed and it is perfectly small, so that it is easy to walk into town to hang out at the pub or eat out at the various restaurants. On our first morning, we met up with our friends at the Coop to prepare a picnic for our journey to the Jungfrau (Yoo ng-frou) Top of Europe, named for being the highest railway station in Europe. 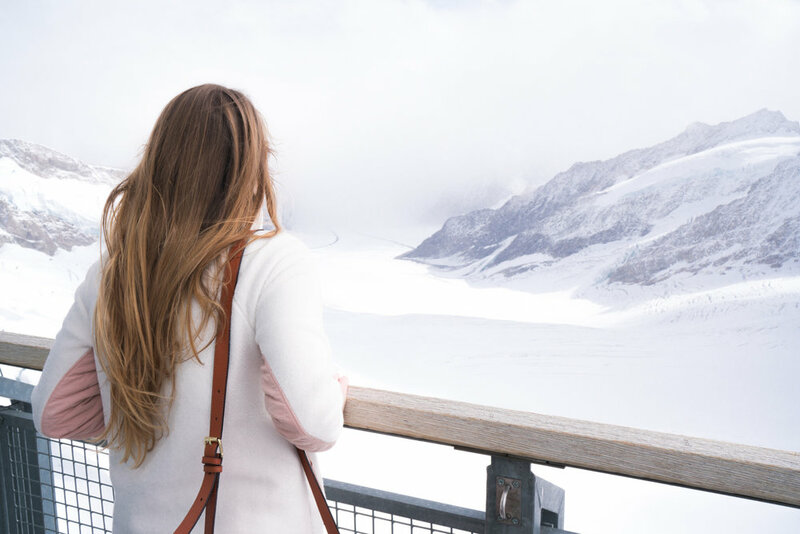 The journey includes taking a cable car from Wengen to Mannlichen, hiking (read: walking at a high altitude) to Kleine Scheidegg, taking the train from Kleine Scheidegg to Jungfrau Top of Europe, returning to Kleine Scheidegg, and finally taking another train back to Wengen. You can and should buy all of your tickets on the day of your travel because weather can be a factor. I won't lie to you, it is not a cheap trip. 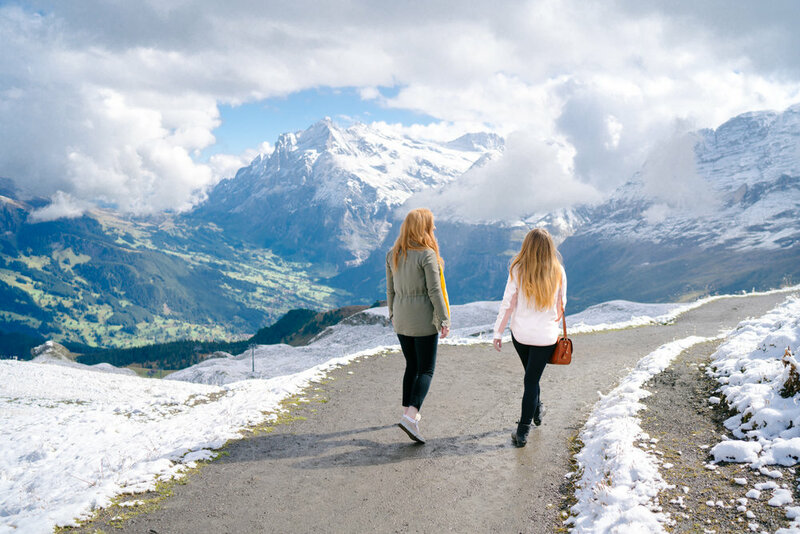 We determined that the Swiss Half Fare Card would be the best deal for us, which provides 50% off all qualifying train and cable car trips within Switzerland. 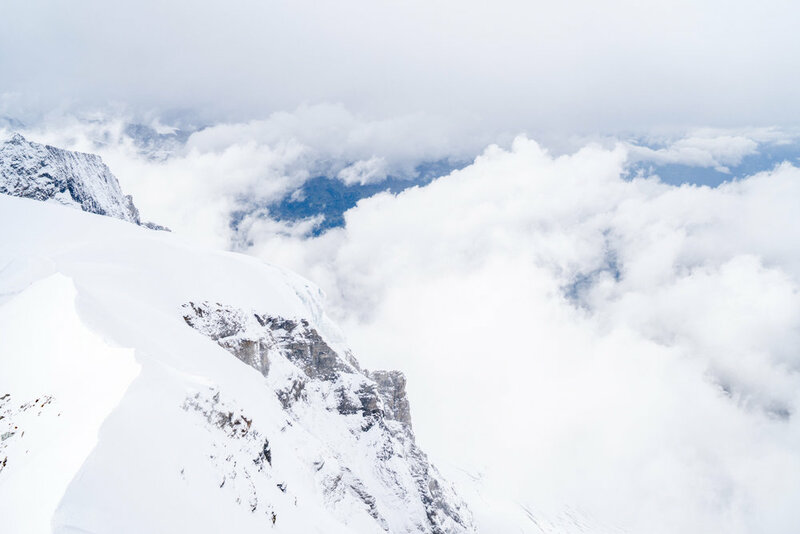 The Jungfrau website does a good job of detailing all of the different prices and methods of getting around the region. We also worked with someone at the SBB customer service desk in Geneva to purchase all of our train tickets and determine what would be the best deal. All costs aside, the panoramic vistas throughout the entire journey make the trip more than worth it! I was so amazed and could not stop taking pictures. Luckily, our friends like taking pictures too. The weather changed very quickly on us. We would see clouds one minute, then clear blue skies, then suddenly we would be enveloped in snowfall. It made for a very exciting journey and we seriously had so much fun. The first opportunity to refuel and refresh is at a little restaurant along the trail with amazing views, an outdoor patio, and a observation tower. 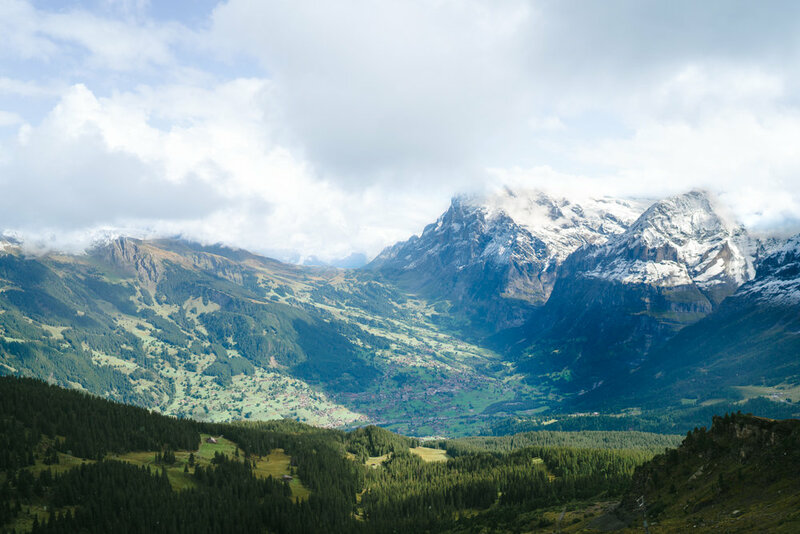 Further up the trail is Kleine Scheidegg station where you will find more food and drink vendors, picnic tables and bathrooms. This is where we decided to have our picnic, and A.D. tried the bratwurst and sauerkraut too. We had intended to make a photo of our picnic, but we were suddenly famished and the altitude was beginning to make its impact. We ate quickly and then purchased our tickets for the train up to Jungfrau. The train drops you off inside a cave and you wander through the various paths to the scenic overlook. 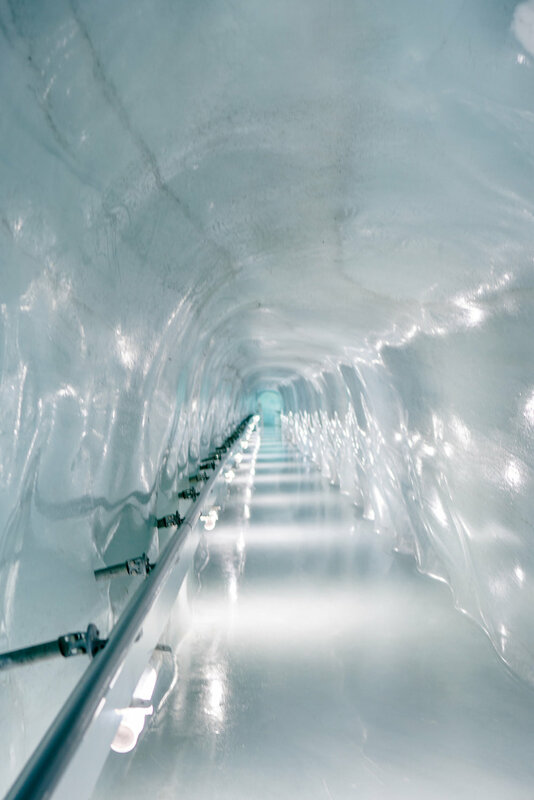 Inside the caves are many exhibits including an Ice Cave with ice sculptures and many artistic and historical tributes to the engineers and workers that built the railway up to the Top of Europe. There are two main outdoor overlooks which provide absolutely breathtaking views. Be warned that it is absolutely freezing, though. The weather kept changing from partly clear skies to cloudy and snowy with high winds. I waited patiently for clear skies so that I could take better photos and I think it almost gave me frost bite! I was warmly dressed but had somehow forgotten gloves which would have been helpful while taking pictures. Luckily there is an indoor area which is heated. We were all chattering and chilled to the bone by the time we left. On the return trip to Kleine Scheidegg the train conductor handed out delicious milk chocolate which was the perfect pick me up. For our last meal in Wengen, we ate at a restaurant called Pasta & More which definitely hit the spot as we were starving. After sharing drinks back at Hotel Falken, we said farewell to Candace and A.D. and packed up for our early morning train ride to Lake Como. Switzerland, you were a dream! Eventually, I will come back and stay for more than two nights.